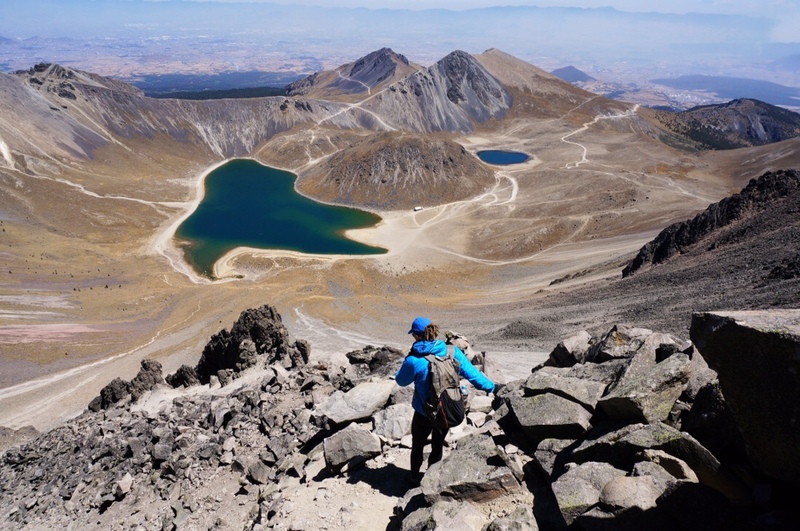 We found a basic room to rent in Raices that served us well as a sort of basecamp from which to execute a climb (sin bicis) of Pico de Fraile, the highest peak on the crater rim of Nevado de Toluca, and the fourth highest peak in Mexico at 3690 meters (15,387 feet). We began our climb of Pico de Fraile by hitchhiking out of town to the park entrance, then taking a “bus” (an old truck stuffed with more people than there were seats) to the trailhead. After gaining the the crater rim, the trail drops down inside the crater, crosses the crater, and goes up the other side. From there an easy 3rd class trail, with a few short bits of hard 3rd/easy 4th class, leads to the summit of Pico de Fraile, going around or over several smaller bumps/peaks along the way. Though there is a supposedly quicker descent route, down a very steep scree chute, we descended the peak the same way we went up. I’m not a fan of steep scree; I prefer to dance around on rock, especially when I’m without trekking poles. We made it back to the trailhead parking lot, in four and a half hours round trip, and caught a bus back down the mountain. The next day we rode our bikes up the road to the trailhead parking lot at just shy of 14,000 feet, then down the other side to the small town of Calimaya. A sweet dog joined us from the park entrance all the way to the trailhead parking lot area, ~10 kilometers. I took to calling her Sicily. She was definitely loved by someone at some point in her life. She parted ways with us at the parking lot. I still find myself thinking about her every now and again. It was a long, fun, descent down into the lowlands south of Toluca. After resting up in Calimaya we left our bikes with a lovely “warmshowers” family in Toluca, then took a bus to Mexico City where we played tourist for a week, before departing to New York for a week to visit family. Looking across the site of Templo Mayor (the great pyramid of Tenochtitlán, circa ~1350 AD) with the Catedral Metropolitana de la Ciudad de Mexico (1573-1813) in the distance. Templo Mayor was the main temple of the Aztecs in their capital city: Tenochtitlán, which now sits in ruins in the center of Mexico City. The contrast of seeing these two cultural relics right next to each other, the Metropolitan Cathedral (Spanish colonial) and Templo Mayor (Aztec), is striking. After Mexico City, we flew to New York to visit family. I was expecting New York (Brooklyn & Manhattan) to be the crazy, busy, loud place I remember it as, but after a week in Mexico City, New York felt so mellow. Around Manhattan …sepia toned–seemed to fit the mood best. With hardly more than 24 hours before our departure back to Mexico City, Kevin (Neon’s youngest) decided he wanted to join us for a while on our ride south. It was fun spending our last day in New York scouring Brooklyn and Manhattan for all the gear he’d need to join us on our ride. All packed up, and for the record, a Surly ECR is hard to pack (it doesn’t fit in one box). So great to see you back! Great scenes of the Central Plateau and of Mexico City. I loved the sepia tone you used for the Big Apple. Had hoped to make it on my last trip, but rained out. Hopefully next time. Looks amazing, similar topography to Paso de Cortes…one of my favorite places in the area!